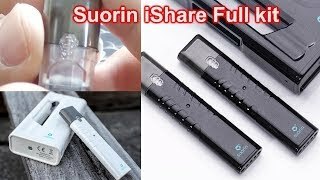 The Suorin iShare does just that - lets you Share. Two mini vapes in one kit! Those looking for something similar to the Juul in a compact size now have a really cool mini vape option that lets you either share a vape with a friend or have a spare for long nights. The Suorin iShare Dual kit comes with two small vapes and it's own charging bank that charges via micro usb. Super clean flavor, long battery life, and a "stealth-like" design easily make this tiny vape a solid option. Now while most of you might already be familiar with the plethora of pod-style devices flooding the market as of late, Suorin has recently released a kit that brings a new and unique take to the world of pod-style starter kits. The Suorin iShare Dual kit is a dual-device/power bank combo that packs two actual cig-a-like units. With a carrying case that doubles as a portable charging bay or power bank, the idea behind this kit is to provide a continuous and interrupted vaping experience. While this all sounds good on paper, let's check out the nitty-gritty on this kit and lay down our conclusions. Sporting a svelte all-black or all-white look (depending on which of the 2 colorways you pick up), the Suorin iShare has all the characteristics of discreet stealth vape. The minimalist branding located on the device and the portable charging bay hardly take away from this which should be good news for anyone who prefers to vape on the down-low. With the overall dimensions of each iShare unit spanning roughly the width of two cigarettes, it's an absolute joy to hold in the hand as the slight ribbing towards the center of each of the two units makes them easy to grip for a non-slip vaping experience. The ergonomic mouthpiece keeps things comfortable even during longer vaping sessions and the sufficient battery venting at the bottom of the iShare is more than enough to keep it from getting warm. Using the smart LED indicator, keeping track of the iShare's status and battery life is simple and intuitive, even for the absolute beginner. One of the biggest advantages of using the iShare over other alternatives is the freedom it gives you when it comes to vaping your favorite e-liquids. Unlike the Pax Juul which uses a closed pod-system, the iShare uses a refillable pod design that holds up to 0.9ml of any e-liquid which includes nicotine-free, nicotine-salt, and freebase nicotine options. 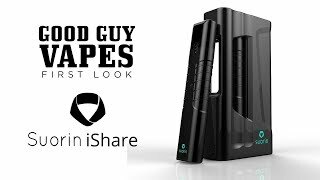 Flavor and vapor production on the iShare is more than satisfactory thanks to the clean flavor output and the relatively powerful 7-watt performance. The air activated sensor which allows for a fully button-less design makes things convenient for both beginners and vaping veterans alike. The iShare fires up quickly and on-demand with little to no delay further enhancing the overall quality feel of the kit. As for the portable power bank/charging bay, it does a great job at delivering an uninterrupted vaping experience. As soon as the battery on one iShare has run out, simply plug it back into the charging bay and take out the second iShare. With the dimensions of the portable charging bay measuring out to the size of a standard pack of cigarettes, it's hardly difficult to carry around. The Suorin iShare presents an interesting alternative to your typical pod-style kit. The freedom to vape with any e-liquid available not to mention the long lasting performance and battery life are all compelling reasons to pick up this unique kit. The icing on the cake, however, is the strong vapor output not to mention straight-up clean flavors the iShare manages to deliver. 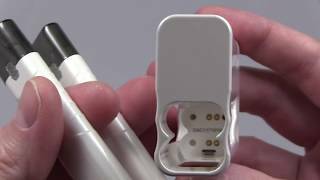 At the end of the day, its a great buy for any aspiring or veteran vaper looking for an easy to use and well-performing portable pod-style kit.